I recently attended the 2016 Wine Bloggers Convention in Lodi. The reception and tasting of a wide range of wines grown and produced in the appellation proved to be both informative and eye opening. Let me say that Lodi even though a large sector of vineyards are quite old there is a lot of contemporary movement in varietals and vineyard management. The Lodi growers are unified in their mission of grape growing using natural techniques and responsible farming. Located only a two hour drive from much of the Bay Area you are swept away into an agricultural area full of multiple forms of fruit being grown by a wide variety of people from many cultures. They combine to bring people grapes, fruit vegetables and other farmed produce to Farmers Markets and wineries throughout all of California. 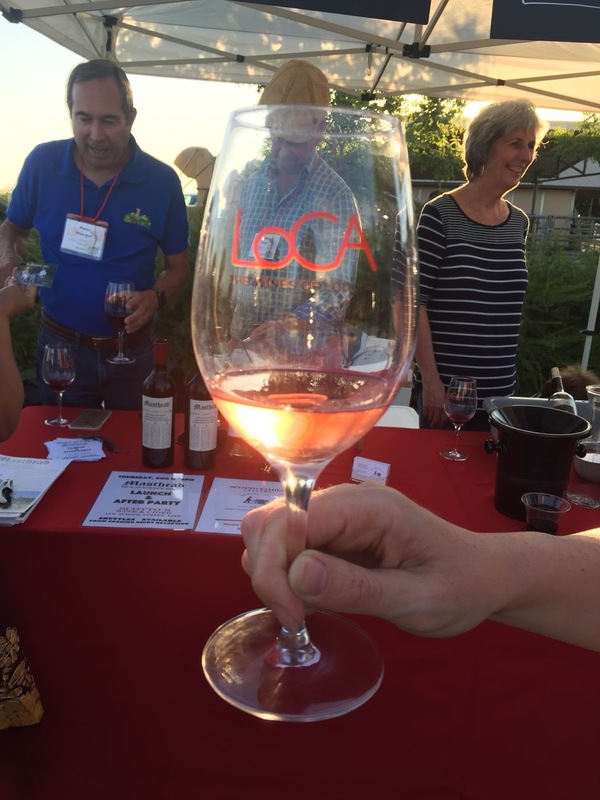 The Lodi Vintners Association are dedicated to farming grapes and other produce in an effort to respect the land and use natural techniques for healthy growing including predators for invasive pests which affect growing and quality. Lodi Rules are some of the most rigorous in the wine industry. This bodes well for the fruit and environment. The vast majority of fruit produced in the area is grapes which were planted prior to prohibition. Since that time owners have changed the varietals grown to reflect the wants and needs of consumers. During Prohibition large quantities of grapes were shipping via rail cars to home wine makers throughout the United States. Instructions were simple do not add water or sugar to the base product. Fermentation started from the natural yeast on the skins. Today the major buyers for large portions of the grapes grown are Gallo and Constellation. There are also major buyers for Zinfandel, Cabernet, Petite Syrah and other varietals from name producers through out the state. The reason is quite simple, Lodi fruit is of high quality and almost always ripe and its sells for much less than fruit from well known sites in Napa, Sonoma and Southern California to name a few. One of the biggest surprises to me was the number of wineries that are producing interesting and high quality wines from varieties not normally seen in California. The quality of white varietals caught me off guard. One example is Acquiesce winery. They make their mark producing Stainless Steel Rhone varieties that are flat out great. Owner and wine maker Sue Tipton has always been fond of white Chateauneuf-du-Pape. She was able to procure vines of Grenache Blanc, Rousanne, Marsanne, Viognier and Picpoul to name a few. These wines are fresh and vibrant with wonder aromatics and clean flavors that have acidity to make them a pleasure to consume. They also bottle all of their wines in Saverglass which gives the impression of the wines of Provence. Another winegrower and producer is Markus Bokisch who hails from Spain. He runs a very successful vineyard management company and as such has access to many top line varietals that are grown to represent the flavors that can come from growing in the Lodi appellation. A list of the Bokisch varietals that he makes and bottles are: Tempranillo, Garnacha, Graciano,Monastrell, Albarino, Verdejo,Veldelho, and Grancha Blanca. They are all a refreshing change of pace and flavor from the major red and white wines produced and sold in most wine shops. His production range for any one wine is no more than a few hundred cases. What is even more impressive is the fact that the majority of his wines retail for $25 or less !! As a vineyard manager he has crossed paths with many big name wineries and wine makers. Markus is well thought of not only in the Lodi community but throughout the larger wine growing fraternity. I have been involved in the wine trade for a few decades and always had a perception that Lodi was a non-destination venue. This Wine Bloggers Conference has opened my eyes. If you are tired of the Napa meet and greet and show me your credit card then Lodi will be a refreshing change. Pace of life is slower and the quality of wine produced is high. The downtown sector is alive with many good quality restaurants and shops. You can also venture out of downtown to one of the many local hispanic restaurants that serve real home made food with regional specialties. Lodi is close enough so that you can make a day of it. You get another perspective of wine and a chance to meet up with some outstanding vintners. There also are plenty of other locally grown items that you can access while in Lodi.